Just three episodes into Season 19 of The Ultimate Fighter the name Daniel “Dragon” Spohn is one that is quickly becoming one of the stars of the season. Spohn’s TUF 19 experience has been quite memorable after leading off the season premier with a devastating 30-second knockout for one of the fastest knockouts in the history of The Ultimate Fighter leading Frankie Edgar to say it was “one of the nastiest knockouts I’ve ever seen in my life.” He followed that with his first fight after getting into the house by defeating Todd Monaghan by unanimous decision to advance in the tournament. The new Dragon Spohn tee, which has the concept previewed to the left, will be released in late May/early June 2014 and will indeed feature Dragon imagery to represent Daniel Spohn’s nickname. More details on the design will be released in the coming weeks and pre-orders are currently underway for the Dan Spohn signature tee at IntimidationClothing.com. A long-time member of Team Intimidation, Dan “Dragon” Spohn, has been a staple of the brand since his early days as a professional Mixed Martial Artist. He will join a all-star lineup of athletes who have their own signature tee from the Intimidation brand already – including UFC Hall of Famer Ken Shamrock, Bellator MMA knockout artist Brian “The Predator” Rogers, UFC female bantamweights Jessamyn Duke and Jessica Eye, UFC lightweight “Relentless” Roger Bowling, UFC vets Jason “Dynamite” Dent, Forrest “The Meat Cleaver” Petz, Wes Sims and Donny “Eagle Eye” Walker and more. Spohn (8-3) is a native of the Cambridge area and is a black belt in traditional kachido akijitsu. Spohn now makes his home in Columbus and holds victories over UFC veteran Josh Hendricks, John Hawk and current NAAFS Light Heavyweight Champion & now TUF 19 vet Josh Stansbury. Intimidation has sponsored Spohn dating back to his 4th pro fight and throughout his NAAFS title run, his days with Bellator MMA, during his 9-second KO at Bellator 51, and his two most recent professional fights in Columbus, Ohio for the UVC. Spohn is a native of the Cambridge area and is a 3rd degree black belt in traditional Kachido Aikijitsu, and now makes his home in Columbus. He holds victories over UFC veteran Josh Hendricks, John Hawk and current NAAFS Light Heavyweight Champion & now TUF 19 vet Josh Stansbury. The Intimidation brand is no stranger to the TUF house as the brand has worked with current UFC lightweight Daron Cruickshank (TUF 15) as well as TUF alumni Jason Dent (TUF 9), Luke Zachrich (TUF 7) and more. Intimidation was a sponsor of Jessamyn Duke during her time on TUF 18 and recently signed TUF 18 and UFC alum Roxanne Modafferi. Season 19 of The Ultimate Fighter began with a bang two weeks ago with a heavy Intimidation flavor, as five Intimidation alumni took to one of the biggest stages in Mixed Martial Arts, led by Team Intimidation’s own Dan “Dragon” Spohn. Tonight, Spohn’s journey on TUF 19 will take another step before our eyes at 10 pm ET on FOX Sports 1. A long-time member of Team Intimidation, Dan “Dragon” Spohn has been a staple of the brand since his early days as a professional Mixed Martial Artist and throughout his NAAFS title run, his days with Bellator MMA, during his 9-second KO at Bellator 51, and his two most recent professional fights in Columbus, Ohio for the UVC. His time on The Ultimate Fighter started with a bang – literally. Just seconds into the fight Spohn landed a hard right on the ear of a charging Tyler King to score one of the fastest knockouts in the history of The Ultimate Fighter. “One of the nastiest knockouts I’ve ever seen in my life,” said former UFC Lightweight Champion Frankie Edgar. Spohn (8-3) is a native of the Cambridge area and is a black belt in traditional kachido akijitsu. Spohn now makes his home in Columbus and holds victories over UFC veteran Josh Hendricks, John Hawk and current NAAFS Light Heavyweight Champion & now TUF 19 vet Josh Stansbury. In a season featuring middleweight and light heavyweight fighters, Intimidation alumni and NAAFS vets Hector Urbina, Doug Sparks, Mike King and Josh Stansbury all had the chance to fight to get into the TUF 19 house. Urbina and King joined the cast as middleweights, while Doug Sparks and Josh Stansbury did not make it into the house as Sparks was submitted and Stansbury injured his knee and was forced to withdraw despite a dominating performance before the injury. After a long and successful career, yet another Intimidation alum has signed with the UFC, as Luke Zachrich is set to make his promotional debut at UFC on FOX 11 this weekend. Zachrich (13-2, 0-0 UFC) is set to face Caio Magalhaes (7-1, 2-1 UFC) on the preliminary card, which will air on FOX Sports 1. A veteran of The Ultimate Fighter 7 and Bellator MMA, Zachrich is a native of Columbus who will make his first UFC appearance after 8 years as a pro fighter. Zachrich enters the UFC on the strength of a 3-fight winning streak, including a win UVC 20 in August 2012, when he claimed the organization’s middleweight title with a unanimous decision victory over Nick Kraus in that event’s headliner. Zachrich also posted victories over Marcus Finch at UVC 23 last year and then a submission victory over Justin Gamble last summer. The owner of Ronin Training Center, Zachrich has built Central Ohio’s top MMA gym that features fast-rising pros and some of Ohio’s top amateurs. Zachrich is also a local restaurant owner and a brown belt in Brazilian Jiu-Jitsu, where he is ranked in the top ten in the world. Zachrich joins a fast-growing list of Intimidation alumni who are currently signed with the UFC, including heavyweight contender Stipe Miocic, female bantamweights Jessamyn Duke, Jessica “Evil” Eye, and Sarah McMann, lightweight Charlie “The Spainard” Brenneman, Strikeforce veteran “Relentless” Roger Bowling, karate superstar Daron Cruickshank, and rising star Anthony “The Recipe” Lapsley. In addition, five Intimidation alumni appeared on the premier of The Ultimate Fighter 19 headlined by Dan “Dragon” Spohn. Intimidation Clothing is a fast-growing UFC inspired MMA clothing brand with a growing national presence and over 50 authorized dealers across the USA. Known as the biggest supporter of local MMA, the Intimidation brand is also regularly featured on multiple sporting events on SpikeTV, AXS TV, SportsTime Ohio, MTV2, FUEL TV, The Comcast Network, Comcast SportsNet and EpixHD as well as MMA highlight shows on Spike TV, AXS TV and more. In addition to over 110 styles of high-quality, bold t-shirts and sweatshirts for men, women and children and is also known for their premium-quality EliteFighter MMA board shorts. Anyone interested in becoming a dealer can apply to sell the Intimidation brand as a dealer and they can be found for sale online at IntimidationClothing.com. Fans can also follow the marketing wing of the Intimidation brand, Intimidation Interactive Media, @IntimidationIM, like Intimidation Clothing on Facebook or follow @IntimidationMMA on Twitter. Multiple alumni of the Intimidation Clothing brand are set to compete on the upcoming 19th season of The Ultimate Fighter, including long-time Team Intimidation member Dan “Dragon” Spohn (pictured). In a season featuring middleweight and light heavyweight fighters, Intimidation alumni and NAAFS vets Hector Urbina, Doug Sparks, Mike King and Josh Stansbury have also been announced as part of the cast. 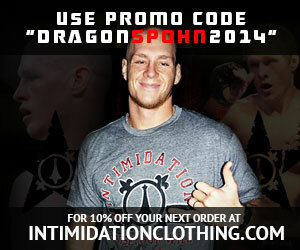 Spohn (8-3) has been a member of Team Intimidation, dating back to his fourth professional fight. Intimidation sponsored Spohn en route to his winning the NAAFS light heavyweight title, in his 9-second knockout win at Bellator 51, and his two most recent fights for the UVC in Columbus. The Cambridge native is a black belt in traditional kachido akijitsu. Spohn now makes his home in Columbus and holds victories over UFC veteran Josh Hendricks, John Hawk and current NAAFS champion Josh Stansbury. Urbina (16-8-1) has been sponsored multiple times by Intimidation, and he is the former middleweight and reigning welterweight champion for the Intimidation sponsored NAAFS organization. Originally from Northwest Ohio, Urbina now lives in Florida where he trains with American Top Team. Indiana native Doug Sparks (7-2) is another of the brand’s alumni as he has picked up 5 submissions while fighting on the regional scene. IN each of his past two fights he has been sponsored by Intimidation Clothing. Originally from Central Ohio, Mike King (5-0) picked up the NAAFS light heavyweight title in 2010 before moving to Florida to train for his pro career. Now with American Top Team, King has been impressive on the regional scene, earning 4 of 5 victories via first round stoppage. And finally, Josh Stansbury (5-2) is the reigning NAAFS light heavyweight champion and was also the amateur heavyweight champion for NAAFS in 2007. These 5 fighters will join 27 other unsigned talents from across the country to compete for a chance to make “the house” in the debut episode on April 16th. Then, the 16 winners will be divided into two teams of 8 to be coached by former UFC champions B.J. Penn and Frankie Edgar. The finalists in the middleweight and light heavyweight division will then compete for a UFC contract at the live finale in Las Vegas on Sunday, July 6th. The Intimidation brand is no stranger to the TUF house as the brand has worked with current UFC lightweight Daron Cruickshank (TUF 15) as well as TUF alumni Jason Dent (TUF 9), Luke Zachrich (TUF 7) and more. Intimidation was a sponsor of Jessamyn Duke (pictured, right) during her time on TUF 18 and recently signed TUF 18 and UFC alum Roxanne Modafferi. Intimidation Clothing is pleased to announce its sponsorship of Rob “The Destroyer” Morrow in his upcoming bout at Colosseum Combat XXVIII on March 1 in Kokomo, Indiana. Morrow (12-15) is set to defend his light heavyweight title against Keith Smetana (6-3) in the night’s main event bout. Although his record is still below .500, Morrow was a very active fighter in 2013, putting together a successful 6-3 campaign including all six victories via stoppage. His 3 losses came to fighters with a combined record of 23-9-1, including Team Intimidation’s Dan “Dragon” Spohn in the main event at the Intimidation-sponsored UVC 22 event. Currently, Morrow is riding a 3-fight winning streak, including a first round knockout victory over Danny Surface at Colosseum Combat XXVII that earned him the organization’s 205-pound title and revenge for a split decision loss to Michael Marrello earlier in the calendar year. This will be Intimidation’s second time sponsoring Morrow, a Chicago native who is active in the region, as he looks to move to 4-0 while fighting for Colosseum Combat. In addition to Surface, Morrow has defeated Jordan Mitchell and Jonathan Ivey for the Kokomo, Indiana-based promotion. Along with sponsoring Morrow, Intimidation is also set to sponsor Michael Eikenberry. Also set to be sponsored on the card were Ryan Thomas and Bobby Emmons before both were forced off with injuries. Intimidation will also serve as a title sponsor for the Colosseum Combat XXVIII event, with products available at the official booth run by Intimidation Indiana/Kentucky crew and Shane Conner. Intimidation Clothing is a fast-growing brand of MMA lifestyle clothing & gear with a growing national presence and over 50 authorized dealers across the USA. Known as the biggest supporter of local MMA, the Intimidation brand is also regularly featured on multiple sporting events on SpikeTV, AXS TV, SportsTime Ohio, MTV2, FUEL TV, The Comcast Network, Comcast SportsNet and EpixHD as well as MMA highlight shows on Spike TV, AXS TV and more. In addition to over 110 styles of high-quality, bold t-shirts and sweatshirts for men, women and children and is also known for their premium-quality EliteFighter MMA board shorts. Anyone interested in becoming a dealer can apply to sell the Intimidation brand as a dealer and they can be found for sale online at IntimidationClothing.com. Fans can also follow the marketing wing of the Intimidation brand, Intimidation Interactive Media, @IntimidationIM, like Intimidation Clothing on Facebook or follow @IntimidationMMA on Twitter. Intimidation Clothing is pleased to announce its continued partnership with Columbus-based promotion Ultimate Victory Challenge, as Intimidation will serve as a title sponsor of this weekend’s “UVC 26: Uprising” event in the capital city of Ohio. UVC 26 is set to feature a solid list of professional and amateur fighters from the Buckeye State, including a main event featuring Team Intimidation’s Tim “Fatboy” Dunn (1-1) taking on unbeaten Indiana-based knockout artist Justin Woods (3-0) in a highly anticipated heavyweight bout. The fighters have a whopping 17 finishes via strikes in 20 combined pro and amateur victories. The event also has an electrifying amateur main event, pitting two young and exciting bantamweight fighters. The bout will feature 19-year-old Jordan Schembri taking on 22-year-old Darnell Pettis in the finals of the organization’s 135-pound tournament to be crowned champion. It’s a classic style match-up, as Schembri brings in a wrestling background while Pettis has been known as an exciting striker. UVC has shown tremendous growth in the two years that it has partnered with Intimidation Clothing, including featuring bouts with top fighters from the Midwest. Notable fighters who have graced the UVC cage including Team Intimidation light heavyweight Dan “Dragon” Spohn (pictured, right), middleweight Luke Zachrich, top featherweight prospect and four-time All American wrestler Lance Palmer, and young heavyweight knockout artist Tim “Fatboy” Dunn. For more information on UVC 26, visit the organization’s Facebook page. Intimidation Clothing is a fast-growing brand of lifestyle apparel & MMA training gear with a growing national presence and over 50 authorized dealers across the USA. The Intimidation brand is regularly featured on multiple sporting events on FOX, SpikeTV, AXS TV, SportsTime Ohio, MTV2, FUEL TV, The Comcast Network, Comcast SportsNet and EpixHD as well as MMA highlight shows on Spike TV, AXS TV and more. In addition to over 110 styles of high-quality, bold t-shirts and sweatshirts for men, women and children the brand is well known for their popular Vintage Series, Local MMA t-shirts and Intimidate Cancer lines of merchandise. Anyone interested can become a dealer by applying to sell the Intimidation brand which is also available for sale online at IntimidationClothing.com. Fans can also follow the marketing wing of the Intimidation brand, Intimidation Interactive Media, @IntimidationIM, like Intimidation Clothing on Facebook or follow @IntimidationMMA on Twitter. There was some serious Team Intimidation flavor at the Cage Fury Fighting Championships 28 event over the weekend in Atlantic City, as two sponsored fighters were in action at the event. Following up on on a perfect 6-0 amateur career, Rebecca Heintzman (1-0) made a successful debut at the event, as she submitted Allison Haynes (0-1) in the second round of their bout. Heintzman (pictured, right) continues to be a part of Intimidation’s support for women’s MMA, as the rising star is one of the sport’s best prospects. Also at CFFC 28, Julian Lane (5-3-1) dropped a razor thin split decision to unbeaten prospect Paul Felder (6-0) in one of the night’s featured bouts. Lane will now travel to Pittsburgh to headline Pinnacle FC 5 against another unbeaten foe in Joey Holt next month. Team Intimidation was also represented well at the Extreme Cage Combat 18 event in Halifax, Nova Scotia, as Intimidation served as a sponsor for the Canadian event. UFC veteran David Loiseau put on a show in the main event, as he claimed the ECC light heavyweight title with a 15-second TKO victory over Mike Kent. Matt McGrath also claimed the ECC welterweight title with a 3rd round TKO victory over Christ Franck at the event. Team Intimidation was also on hand sponsoring the Blaze Kids Challenge near Chicago, as Premier Fight Supply represented the brand at the event. The event, designed to get kids to be more active, featured strength tests, explosion tests, speed tests, and more and continues Intimidation’s strong push into the Chicago market. In Intimidation Alumni news, UFC veteran Charlie Brenneman (pictured, left) picked up a win over Kyle Baker in the CFFC 28 main event, and he is now 4-0 since being cut by the UFC last year and dropping to lightweight. Brenneman seems poised to get the call from the UFC yeat again having now reinvented himself as a lightweight after a 4-4 run at 170lbs in the UFC from 2010-2012. Also, former Bellator tournament finalist Luis Nogueira returned stateside for the first time in more than a year, as the Brazilian submitted Frank Baca with an arm triangle choke in the first round at Bellator 105. Looking ahead, Intimidation will have a busy first weekend of November, as Team Intimidation will be on hand sponsoring and selling at both the UVC 26 event in Columbus, Ohio, and Hardrock MMA 58 event in Bowling Green, Kentucky with crews on hand at both events. Heintzman photo courtesy of CFFC. Intimidation Clothing is pleased to announce its sponsorship of the upcoming Caged Madness 26 event, which is set to take place on October 12 in Akron, Ohio. The event, promoted by Explosive Fight Promotions, will feature the latest installment of the EFP pro and amateur series. The other semifinal will pit debuting fighters Curt Lemmon (0-0) and Devon Wilson (0-0). All 4 fighters had extensive and successful amateur careers, and the winner of the tournament will be propelled onto the next level of prospects in the state and the country. Along with sponsoring the event, Intimidation will also be on hand selling its popular brand of t-shirts, hats, hoodies, fight shorts, and more. Intimidation Clothing is pleased to announce its sponsorship of Tim “Fatboy” Dunn at the upcoming Caged Madness 26 event, which is set to take place on October 12 in Akron, Ohio. Dunn (1-0) is set to take on West Virginia product Jeremy Linville in the semifinals of a 4-man heavyweight tournament at the event. Along with sponsoring Dunn, Intimidation will also be a sponsor of the Caged Madness 26 event, and will be on hand selling its popular brand of t-shirts, hats, hoodies, fight shorts, and more. Intimidation Clothing is pleased to announce its sponsorship of rising professional fighter Matt “Angerfist” Anderson in his upcoming bout on Sept. 14 in Columbus, Ohio. Anderson (1-1) will look for his second straight win as he takes on Portland Pringle III (1-0) in a featured professional bout at the Absolute Cage Fighting event. Anderson, who has been a staple on the Ohio MMA scene since debuting as an amateur in 2007, signed on as part of Team Intimidation prior to earning his first professional victory with a second round submission win over Jeramy Karshner at UVC 23 in May. Now, the 25-year-old looks for his second straight win as he once again fights in his hometown. Known for his unorthodox striking and grappling style, “Angerfist” is a rising star on the MMA scene.